It’s surprising where research for an historical romance can lead! I’m now writing a western set in 19th century Oregon about a man who wants to try wheat farming (yes, there’s a love story, but research about wheat came first). Wheat has been grown for at least 7000 years -- not for fun, but for survival. Wheat is ground into flour which makes bread which feeds people; were it not for wheat civilization might have petered out thousands of years ago. Not only can wheat be eaten, it can be stored for food during winter and as seed for a new crop in the spring. Villages developed where land was available to grow wheat. Bronze tablets dating from the 9th century B.C. show the grinding of wheat and bread-making in Assyria. Ancient Egypt grew wheat, aided by its network of irrigation canals, which demanded organization and supervision. Growing food led to trade, development of language, mathematics, and business and diplomatic relations with other villages and later nations. . Today, wheat is the world’s number one farm crop, from the poles to the equator, from sea level to the Himalayas. There are thousands of wheat strains; some suited to heat, some to cold, wet, drought, you name it. Wheat growers harvested their crops with a sickle or a scythe, cutting their way through the stalks while others followed to collect the bunches of grain and bind into sheaves. It was hot, sweaty, dusty, back-breaking work. Things improved when a cradle was added to the scythe, the curving fingers of which caught the grain as it was cut, leaving it bunched and easier to tie into bundles. Still, a strong and experienced man could cut only two acres of wheat a day. Separating out the grain kernels was even more primitive: either a farmer beat the wheat with a flail or had his cattle tramp again and again over the wheat heads. When only 15, Cyrus McCormick invented a lightweight grain cradle, with which he could keep up with the older men in reaping, and that was the beginning of mechanized wheat production. Later, McCormick’s invention of the reaper changed harvesting forever. The first reaper was a two-wheeled, horse-drawn arrangement; blades clipped the stalks close to the ground and a rotating wheel pushed it into the cutting blades and then back onto a platform as it was cut. But that was in Virginia. What about Oregon? 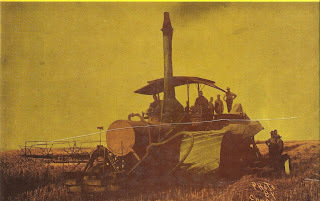 The mechanical reaper opened the floodgate and new machines poured into the farming areas. 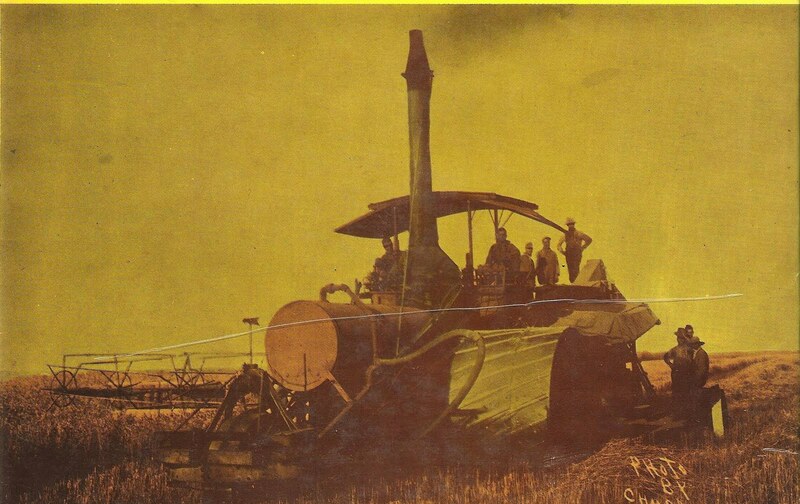 By the mid-1880s, a single Oregon farmer could handle vast acres of wheat. Wheat flourished in the Willamette valley, despite the lack of a local market. It was expensive to ship down the river or overland, and by 1863 attention focused on the railroads, in particular a rail line connecting Portland to San Francisco. During the Gold Rush, when mining towns were provisioned by farmers in the Rogue River and Umpqua Valleys, long trains of pack mules carried loads of flour from the mills. Later gold strikes in Oregon quickly built small cities and by 1870, a wheat-consuming population created a healthy demand for flour and wheat-farming took off. By 1867 Oregon flour was known as the highest priced and best flour on the New York market. That year, $149,065 worth of flour moved from Portland to California, where it sold for $5 a barrel. At the gold mines in California markets, it brought up to $25 per barrel. Exported wheat even reached the East Coast by a circuitous route: by ship from Astoria, Oregon, to Boston by way of the Hawaiian Islands. The highlight of the wheat-farmer’s year was the harvest. When the stalks turn yellow and the kernels have fully dried out, wheat is ready to be harvested. Old-timers cut wheat using a scythe. The cut wheat was then “stooked,” or gathered by hand into sheaves. These were then brought in from the field to the threshing area, laid out on a canvas or tarpaulin, and beaten with a flail until the wheat separates from the straw. It’s still full of chaff, the fibrous outer shell of each kernel on the head, and for this the farmer needs a windy day and a lot of help. In ancient times, people tossed the wheat into the air, and - because wheat is heavier than chaff, it falls to the ground and the chaff is blown away. Using the hand-flailing method, it takes 1 - 2 hours to gather a gallon (4 stooks) of finished wheat, which can yield anywhere from 8 to 60 bushels of wheat per acre, depending on weather, disease, rainfall, etc. etc. After inventing the reaper in 1831, McCormick kept tinkering and improvements in farm machinery increased. These included a wire binder. Adding a binder to the reaper, pulled by four horses, a farmer could cut widths from 6 to 8 feet and dump the wheat onto a revolving canvas belt which carried it into a tying mechanism. When a certain amount of wheat was gathered, a needle was tripped which sent a long curved metal arm around the stalks and knotted it with twine. One or two men called shockers speared the bundles with a pitchfork into shocks, five or six bundles standing upright by themselves. The bundle wagons then moved onto the field and two men pitched the bound grain onto the flat beds. In the latter part of the 19th century, wheat farming became even more mechanized with the labor-saving threshing machine. Each year threshing crews moved from farm to farm, feeding wheat bundles into a threshing machine, usually set up in the farmyard. Here the grain was separated, the chaff flying out one end and the grain funneled out the side to sack-sewers, who bagged the separated grain and needle-stitched the gunnysacks closed at the top. And at harvest time, when threshing crews appeared on farmsteads and the farm women cooked and served them three hearty meals each day, romance could bloom . . . Very cool. It's sick how much I love the research part of being a historical novelist. Eco-historian Alfred Crosby has theorized that the reason the Great Plains was the last to be settled was because there was no crop which would grow and thrive on semi-arid plains--except cattle and buffalo (hence ranching). It wasn't until the 1870s when the immigrants from southeastern Europe arrived with a wheat specie, Crimean Red, from the Caucacus steppes. The threshing crew practice continues until roughly the beginning of World War II. In many ways, it was "the big social event" of the year. Great post, Lynna! As Kalen says, research is one of the most fun parts of being an historical novelist. It's fascinating where the research for a particular book takes one!